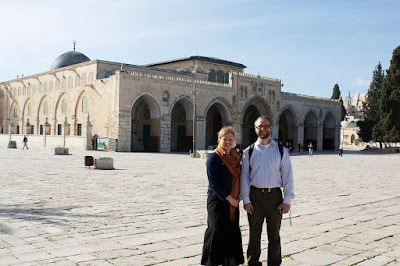 Max and I were VERY fortunate to be able to visit Al-Haram Al-Sharif, or as many non-muslims call it, the Temple Mount. 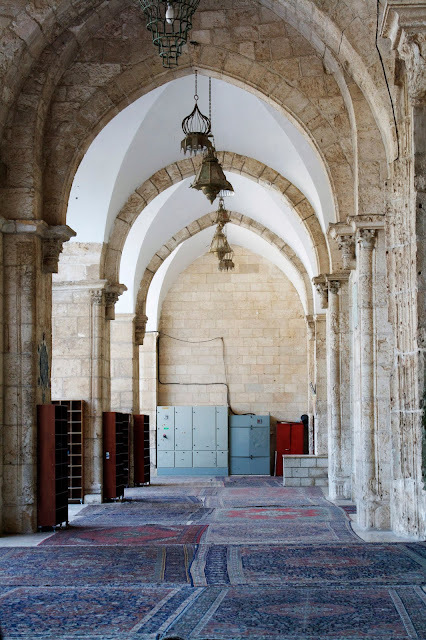 The entire complex contains Al-Aqsa mosque, the Dome of the Rock, El-Marwani Mosque and other madrasas, libraries, and museuems. 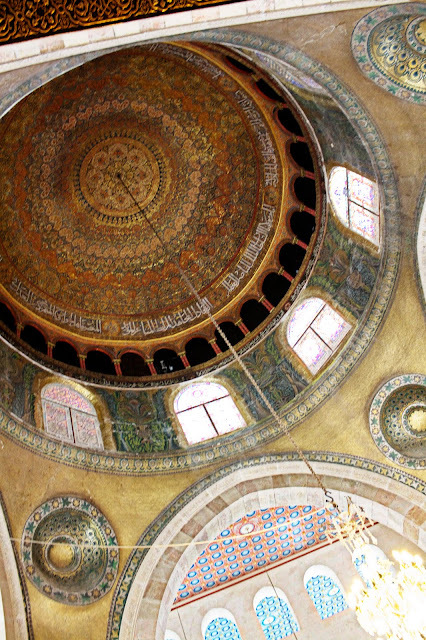 Iconicaly associated with Islam because of the golden dome, the compound has a past that makes it holy to Christians and Jews as well. 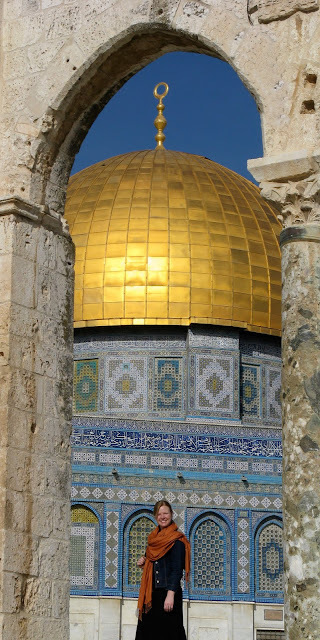 Both the first and second temples were built in this space and the Holy of Holies is said to be directly at the center of the Dome of the Rock. 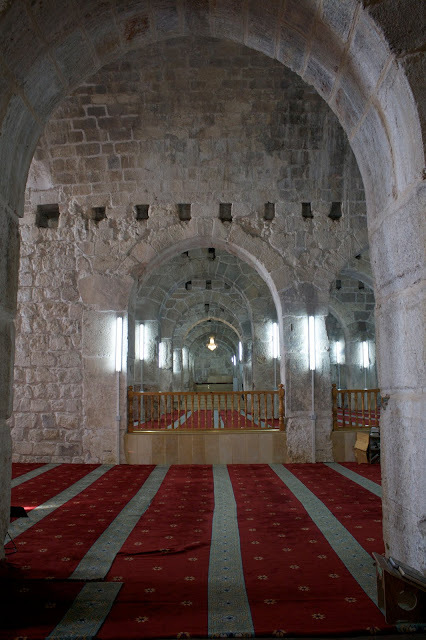 This central space is called "The Well of Souls" by Muslims. In fact, that picture of us in front of a rock? It is the "foundation stone" as the Jews know it in the Well of Souls and directly where the Holy of Holies is said to have been. Can you see why things are complicated here? 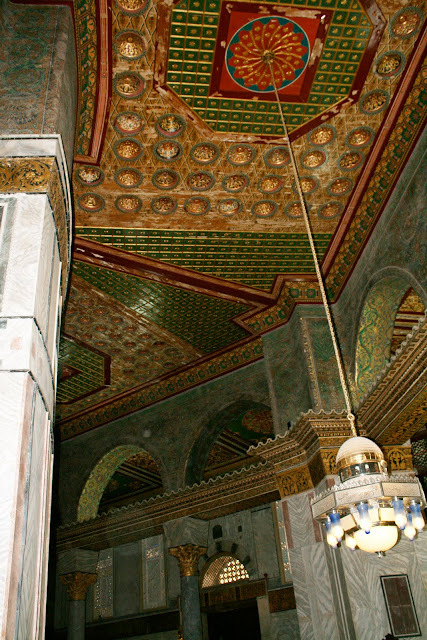 The pictures above are of the Dome of the Rock and the pictures below are of Al Aqsa Mosque. They are not open to the public, but, like I said, we were VERY fortunate to be able to tour the inside of all of these beautiful buildings. 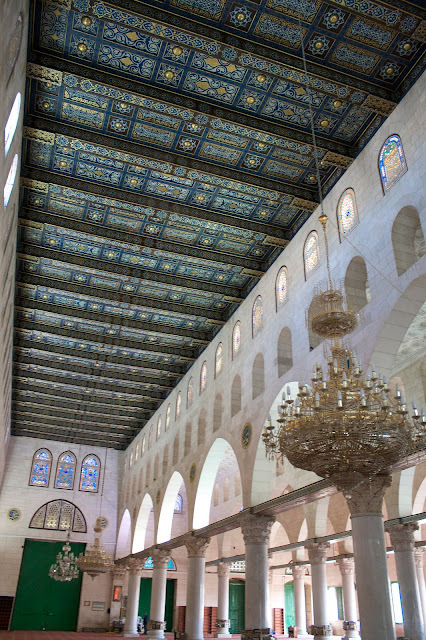 The Al-Aqsa Mosque is the holiest sight for Muslims outside of Saudi Arabia (Mecca and Medina) and it is mentioned in the Koran. It is the sight of Muhammad's night journey into the heavens. Lastly, we were able to see the enormous Al-Marwani mosque, formerly thought to be the place where Soloman housed his horses. The internet and my Mac are pretty much indispensable parts of my life abroad. If I had to choose between bringing more than one change of clothing or my Mac somewhere, I'd bring my Mac. That pretty much goes for any kind of either/or scenario with me. 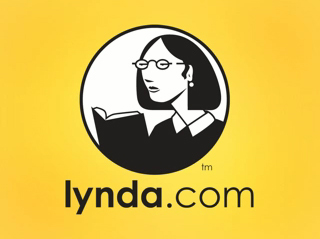 Lynda.com is a collection of software training videos. Ok, that sounds boring, but it's amazing. For a whopping 25 bucks a month I have unlimited access to hundreds, probably thousands of hours of training videos on programs like the Adobe Design Suite (Photoshop, Illustrator, etc - these are the courses I'm making my way through right now), movie editing software, web design software, and much more. You could get the education of an entire bachelors degree and have REAL skills to put on your resume in weeks, even days. So, it's awesome. ...they should offer library subscriptions...huh....that's a good idea actually. What could be nicer? Each week they bring you a theme and three stories that illustrate that theme. Stories that are funny, sad, thoughtful, fiction, non-fiction and all of them diverse slices of the American life. This week's theme was "Contents Unknown" which started off with a story about storage locker bidding when people can't make their payments. People buy the locker, not knowing fully what's inside, and hope there is treasure behind the dusty piles of junk. If you have an ipod or a computer and one hour each week I highly recommend this podcast. 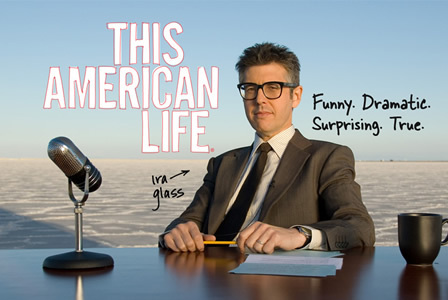 I actually found out about The Moth from This American Life - the Moth's theme is "true stories told live without notes". 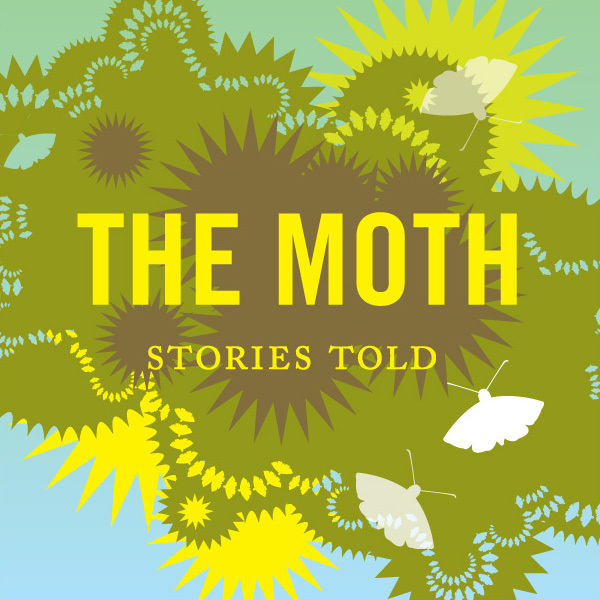 There are a few Moth stages around America (mostly the east coast) where people come to tell and hear stories told live. Some are funny, amazing, sad, heartbreaking, drop dead hilarious - and all true, told without notes. Great, great, great podcast. How did I live without this!?! Two fabulously nerdy hosts (and I mean that in the best way) tackle different subjects in history and well, tell you about them. They research and report. It's that simple. They usually include fascinating and juicy tidbits you didn't know before -1/2 a percent of the world's population today are directs descendants of Ghengis Khan for example. Talk about a fertile myrtle A few that I listened to in the past week were: "Harry Houdini: Master Mystifier", "How Kent State Worked", "How the Dancing Plague of 1815 Worked", "Alexander Hamilton vs. Aaron Burr", and "Who Was the Real Count Dracula". They last from 2 minutes to 30. If you have a learning addiction, this is your feed. Fabulous. Oh Rick Steves, how I love you. 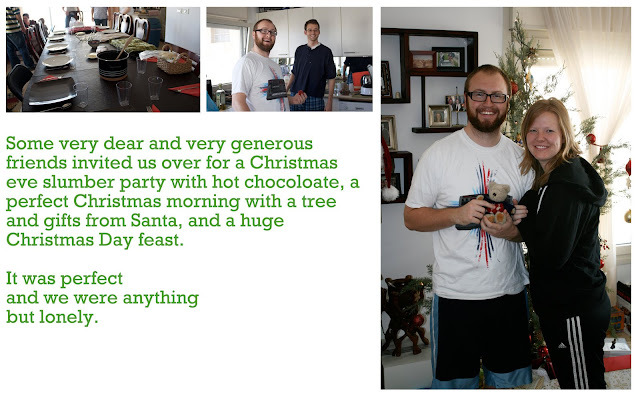 I actually started a Christmas letter to Rick Steves, but I haven't sent it yet. Perhaps by the end of February I'll have found a way to say all of the nice things I'd like to say to him. Not the least of which is "thank you for your awesome podcast" -which you can also find on youtube if podcasts aren't your thing. These podcasts are 3 to 4 minute snippets from his PBS travel show. If you ever need a little 5 minute break from reality, you can travel to the Alps and discover amazing Gimmelwald, or stroll the promenades of Nice with Rick. It's the perfect little virtual travel break to get you excited about seeing more of the world or give you reprieve from your corner of it for a time. If Max and I have 5 minutes before the bus comes, I usually make him watch one with me. I would also HIGHLY recommend you check out his series about Iran (both the lectures and the hour tv special) and his multi-part lecture series "Travel as Political Act". These two programs in particular are why I'm writing him a thank you letter. At the core of everything he does lies the conviction that learning about other people and cultures breaks down negative and useless boundaries and builds bridges within our universal humanity -that ignorance and fear is best combated by knowledge travel. Preview for Iran Program. The last 30 seconds in particular are heart stopping to me. Travel as diplomacy! So in part, this is what I do all day. All of these things (with the exception of Lynda.com) are free. You can download them from their respective websites, or find them in the podcast directory of itunes. "In a number of key categories, the amount of ground gained or regained since the early 1990’s is truly stunning. Crime, especially, has plummeted. According to the National Crime Victimization Survey (NCVS), the rates of both violent crime and property crime fell significantly between 1993 and 2005, reaching their lowest levels since 1973 (the first year for which such data are available). More recent figures from the FBI, which measures crime differently from the NCVS, show an unfortunate uptick in violent crime in the last two years—particularly in cities like Baltimore, Boston, Philadelphia, and Washington, D.C. Even so, however, the overall rate remains far below that of the mid-1990’s. John P. Walters, director of the Office of National Drug Control Policy, has summarized these across-the-board findings in one succinct sentence: “We have a broad set of behaviors by young people that are going in a healthy direction." It seems to me that we ought be wary of people who continually ignore positive trends like these just so they have something to rage against. I'm just sayin'. Isn't this the best, most beautiful coat? Well, it's my new coat for the time being. As a preface, the first week of class it was raining and this woman INSISTED that I get a ride home with her instead of taking the bus. She really would not take no for an answer. I was very concerned with "professionalism" and so I said yes, but planned to turn her down in the future. But the truth is I like the ride home instead of taking the bus AND to boot she really wouldn't let me out of it if I put of a fight anyway. The generosity of Muslims is amazing, if un-turn-downable. 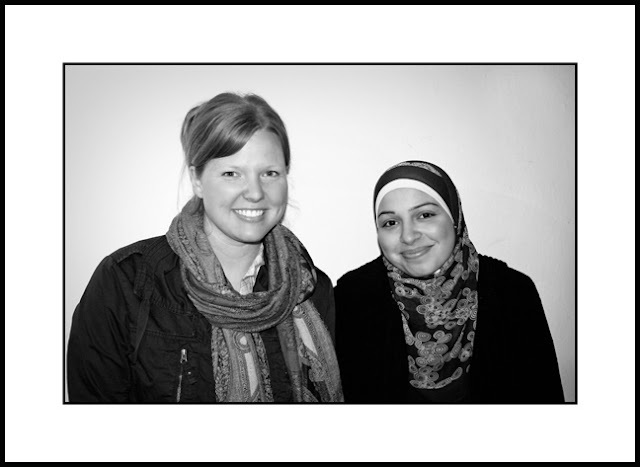 As a Christian I feel like I have a lot to learn about charity from some of my Muslim friends. So I just accept the ride home at this point and everyone is happy. So I was riding home with her today and as she dropped me off she reached into the backseat and brought up a white shopping bag. "I think this will look nice on you" she says, handing me the bag containing a COAT. Seriously. I argued for a while that I didn't really need it and that I really appreciated her thoughtfulness, but I just couldn't take it. 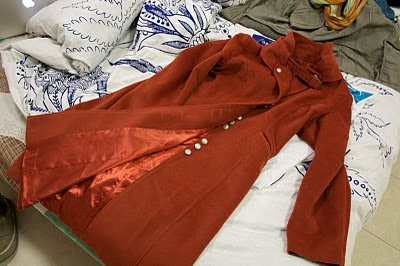 But as always, Hakum won and I have a new coat. I made her promise that when the weather got better she would let me return it, but I think even that might take some serious persuasion. And it's not just something she had lying around, I'm sure it's the nicest, most expensive coat in her closet. Geez. This moment echoes many we had in Amman last summer and that we have had in Jerusalem. 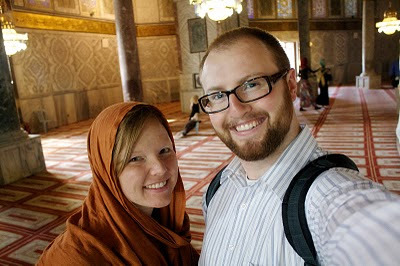 In the West we have become so obsessed with the idea that Islam breeds fanaticism (which I reject entirely as any religion can be and has been exploited to encourage fanaticism) but we don't identify Islam with its many virtues, charity and hospitality being among the greatest in my estimation. 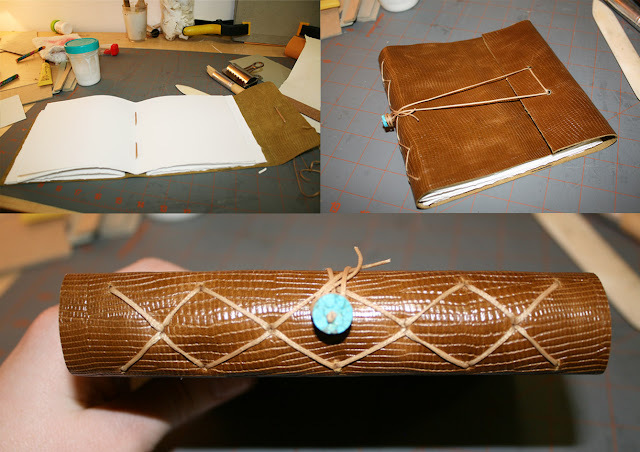 I'm really excited about this series of journals I'm working on. 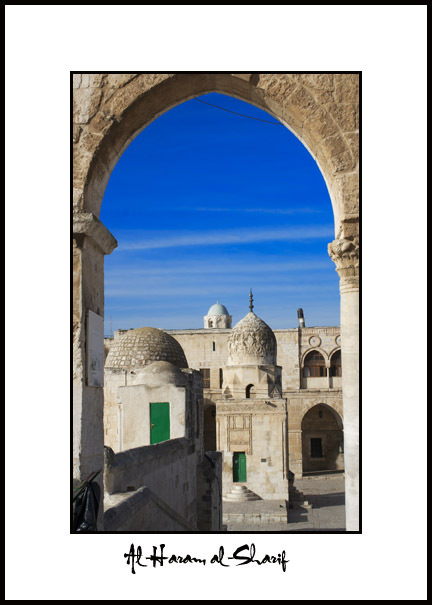 The second one has a picture of the Western Wall and if I do a third it will have an illustration of The Holy Sepulcher. For you nerds out there, I sewed them on linen tapes and bound them with a traditional flat back case binding. 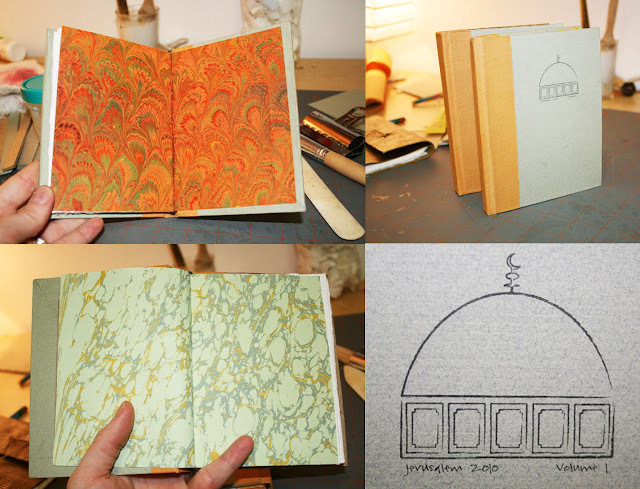 I used hand marbled paper I got in Siena, Italy last year for the fly pages and hand sewed head bands on top and bottom with the bead on the spine (not pictured). I'm taking an Adobe Illustrater classes online again (lynda.com - you are the best thing since my Max) and the illustrations are original. I'm thinking about making some sort of clamshell box or slip case to house them when I decide how many volumes I want. Anyway, this happened about a month ago actually, but it's worth telling. I usually ride Arab bus #74 to work each week and it takes me exactly where I need to go to and from work. But a few weeks ago I got on the 74 and instead of going toward Beit Hanina it took a turn in the opposite direction and got onto the freeway going towards a town called Pizgat Ze'ev. I tried not to panic because surely the bus would turn back around shortly, but when it finally came back to shufat road (where my work is) it had passed by my work and as far as I knew was headed to Ramallah. I, without my passport let alone time to spare, began to get a little nervous. To add to my nervous-ness a few men from the back started yelling at the bus driver. From what I could tell they wanted to know why we had taken a different route as well and they were very displeased. At one point the bus driver pulled over to the side of the road rather abruptly, yelled something fierce sounding, and motioned for them to get off the bus. The arguing continued and as they were stepping off the bus the driver had one last thing to say (probably about someone's mother) and the last man off the bus turned and lunged towards the driver. His friends held him back and dragged him away and the driver quickly shut the door in his face before merging back with traffic. People didn't really seemed bothered by this incident, but I was still a ways away from my work (...as far as I could tell). At one point everyone emptied off the bus except for a very nice woman and her little boy. I had previously been hiding midway back on the bus next to the window, but at this point I made my way to the front. With the help of the nice mother the three of us figured out that I needed to be back a few miles. "Just stick with me - I'll get you where you need to go" the bus driver said as he flipped a ridiculous U-turn passing several construction signs that probably said "Do not turn around here." And sure enough I was dropped off at the front door of my work in just a few minutes. Turns out there was a GIANT accident blocking my normal route to work. Not hearing overhead messages on the bus that might save me oodles of stress is really increasing my motivation to learn Arabic. If you have a year to send out Wedding Thank Yous then you certainly should get at least a month to report on Christmas. We also went to a neat Anglican Carol service that included the Sweedish Santa Lucia song and processional. This video captures a little bit of what it looked like. You Can Always Find Another "One"
I started teaching my ESL class again today and it is going to be a great 'semester'. I got re-nervous about teaching over the break, but today went very smoothly. I am actually teaching two maybe even three classes this go around. That means I work 12 hours a week, 4 nights a week so far. I have found that I am much more selfish with my time when I have a lot of it. 12-16 hours seemed like an overload at first, but I think it will be just fine. Today we talked about making predictions and, wait for it, Soap Operas. Apparently understanding 'Days of our Lives' will help to foster a more complete language learning experience. It was actually a riot because the lesson revolved around Nina, a wealthy Indian woman from a well-connected family and her love for Sanjay, a lowly soccer player without money or prospects. We were learning about using "will" and "won't" to make predictions about their future - will they run away and get married or will Nina's parents make her move to London and marry someone respectable? Well, this lead us to a discussion of love vs. respect of parents because Nina's parents would not allow her to marry Sanjay. Overwhelmingly my student thought that Nina should obey her parents and not marry Sanjay, even if it was "breaking her heart in two" I kept trying to convince them that love was more important (a little argument makes for good discussion in my class) only to hear responses like "Family is love. " It's so perfectly Arab. Arab culture is very focused on the family and honor and evidently familial love is more important than romantic love - at least to my students. But my favorite response was "You can always find another "one" (as in 'your one true love'), but it is impossible to find another family." Sans vehicle here in Israel, I have become a pretty serious bus rider. It occurred to me while riding home from work the other day after being blessed by a lovely old woman with just one rotting tooth that I ought to be recording these moments. Some are tender, some are scary, and others are bizarre. Hopefully "On the Bus" will be a recurring feature on our blog. But first I want to share a quick insight about the bus system. There are separate buses for Arabs and Israeli's here in Jerusalem. I'm going to write that again for emphasis. There are separate buses for Arabs and Israelis here in Jerusalem. The idea that these people who live in the same city have two completely separate bus systems and routes kind of exploded my brain for a little bit when I realized it. There are many things that we abhor in America but don't recognize when we see them played out somewhere else. Seeing the segregation of people as defined by the buses they ride has a bit of an America 1950's feel to me and not in a "gee hula hoops are fun" kind of way. Although there are no laws about who can ride which bus, very seldom do riders of one type of bus venture onto the "other" bus system. (In this occasion I would argue that more Arabs ride Israeli buses than the other way around. Probably due to the fact that the majority of services and work opportunities in Israel are in areas only serviced by Israeli buses) Granted this segregation is, in part, a product of self selection, but it's unsettling to think that two teenage boys the same age might never see the area where the other lived, worked, or went to school even though they live 10 minutes away from each other. It's like the groups live separate lives right along side each other but their counterpart is always invisible. It's just one of many symptoms that speak to how divided the city is. But moving on to my much appreciated blessing yesterday on the Arab bus: I was riding home from Beit Hanina (where I teach my classes) and a very old woman with a crooked back, white lacey shawl covering the almost horizontal rise of her spine, tottered onto the bus and found a seat beside me. I responded with the appropriate "Al-hamdu lillah" (Praise be to God) and she responded back with the same. "Hayik Allah. Shukran, Shukran." She continued, blessing me with life from God. She said thank you several times in a little bit of a crazy, shaky person kind of way, but it was very sweet all the same. A few weeks ago I witnessed a bus fight and got lost in East Jerusalem, but I'll save that for another day! 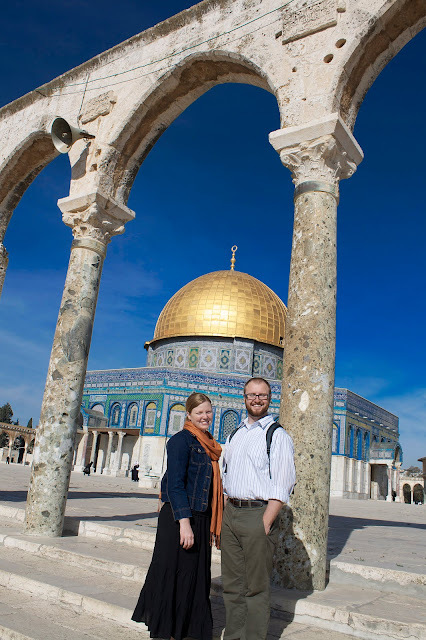 In my most recent post, I alluded to certain restrictions placed upon Mormons while in Israel. I haven't written on this subject (or really any subject for some time, for which I do apologize) because I was hesitant about bringing it up. 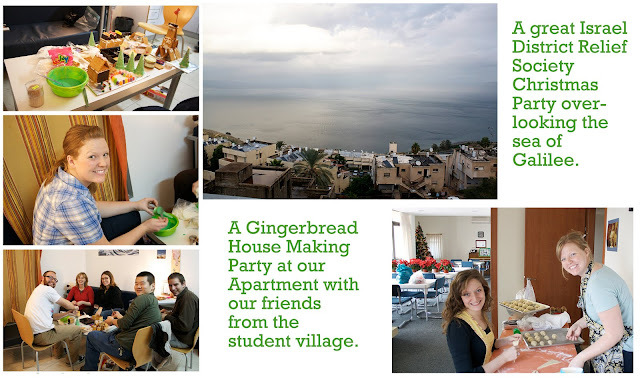 I have expressed my opinion on the subject to close friends and family, but I don't want to publicly air disparaging or cynical opinions while I am a guest (and a very comfortable one at that) of Israel. Especially since my proximity to the situations that exist here in Israel (remember the burning garbage blocking the bus I was on? No? Well, it happened.) has given me a much more nuanced and complicated view of the things that make Israeli society so sensitive to real and perceived threats. So, this is the situation: in the mid-80s, the LDS Church began construction of the BYU Center on Mount Scopus which looks right down on to the Old City and the Dome of the Rock. This touched off a huge and prolonged protest by the Haredim of Jerusalem (roughly a quarter of the city's population) who demonstrated outside the construction site, at the mayor's office and at the hotel where the BYU President was staying. Death threats were called in and the construction site itself was attacked twice in attempts to halt construction. Along with this, many community leaders called for BYU to scrap its plans and to find another place to build. Eventually, Senator Orrin Hatch (whose most recent foray into Jewish culture included a song for Hanukkah; my review of that song will not be forthcoming) began to ask people in the US to send letters of support for the Church to Israel in order to placate the opposition. This, however, was not enough. The political risks of allowing the Center to be built were too great for the coalition government of Israel. 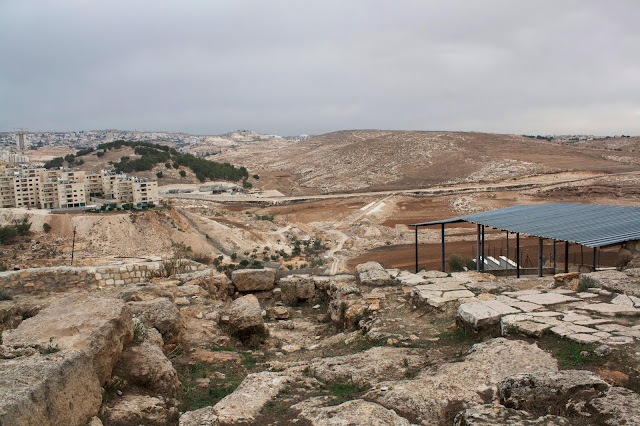 Thus, the State of Israel requested that the Church sign a document, forswearing any and all preaching or proselytizing activities in Israel by any of its members, which would ease the pressure on the government and allow the building to be finished. The Church relented and since that time, those have been the restrictions upon members of the Church in Israel: even if non-Israeli, non-Jewish people ask questions about the Church, we are under obligation not to answer while we are in Israel. For example, a few weeks ago in one of my classes (where the vast majority of the students are not Israeli), the topic of Mormons came up and there were multiple inquiries into "What do they really believe?" and "They are heretics, right?" and I had to sit quietly, because if I had piped up and said "Hey, we aren't heretics!" the inevitable follow-up questions could not have been answered to anyone's satisfaction, particularly mine. As it stands, the LDS Church is the only religion under such restrictions in Israel. And I have come to a grudging peace with this fact, since the agreement was signed by the leaders of the Church and, since the Church is under obligation, then I am under obligation as well. If we don't keep our word, what kind of people are we? Multiple people have tried to convince me that going around this obligation would be fine "in an academic setting," but I always have to explain that I cannot dispassionately discuss the tenets of my faith without defending or promoting my beliefs and that would be a violation of the the agreement. If you want a more detailed read on the situation, the Wikipedia page is a good place to start off. This site is also good, giving a few more specifics and a great quote from President Hinckley, who certainly had a front row seat to this event. Also, Daniel H Olsen and Jeanne Kay Guelke of the University of Waterloo wrote a terrific paper titled "Spatial Transgression and the BYU Jerusalem Center Controversy" which is available for purchase here, but I would recommend going to your local university and reading it there for free (it was printed in The Professional Geographer, Volume 56, Issue 4). "Are there cute Mormon girls?" That's what he asked me as I stepped off the treadmill. He is a gym madrich (guide or assistant in Hebrew) who lives near us and last Saturday he saw me and Brooke walking to church. I may be the only guy in our student dormitory complex that owns a suit and tie and this madrich, when he spotted me at the gym, came over and wanted to know where we were going in such formal duds. "Well, we go to church. We like to dress sharp"
"What sect of Christian are you?" "Ah, yes. Mormons. 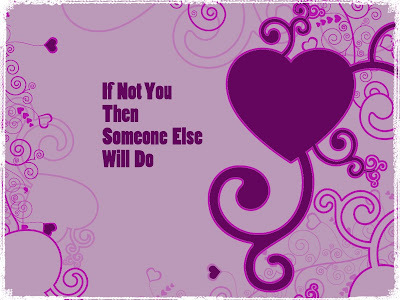 I know." "Hmm, interesting. But I do have one question." "Are there any cute Mormon girls?" With evident relief, I said yes, however they generally marry cute Mormon boys. He smiled and seemed undeterred by this obstacle. It's been nice to take some time off from blogging - to reclaim a portion of my inner thoughts - I may do it more often. I find that when I blog less I write in my journal more (one of my favorite things to do). I'm sure I'll find a balance. I will get to posting about our wonderful Christmas and New Years, but I just had to confront my growing jealousy before it got out of hand... I just started reading "The People of the Book" by Geraldine Brooks and I'm only at page 10, but I think I'll really like it. It is about an ancient manuscript and its travels through history as told by the ephemera found in its spine by book conservator, Hanna Heath. That's all I know about it. But when, on page 4, Hannah described her conservators lab, down to the wheat paste and linen threads, I was seized with what (embarrassingly) is best described as uncontrollable jealously - for her tools, her job, her knowledge and her skills. Is that the dumbest thing? ...also, she's not real. This happens to me when I read about books. I have also been reading "A Gentle Madness" about eccentric book collectors and collections and as much I as am LOVING it I am also always slightly put off when I put the book down. And here's why. I'm jealous that they have so much more and so much cooler knowledge than me. I want Hannah Health's studio and I'd like to work for some organization that would fly me across the world to repair their manuscripts collection. I wish my skills were good enough to have earned that studio. I wish I recognized all of the volumes that crazy Mr. So and So had purchased at an estate sale last winter and why they are important in the book collecting world. But it's a good jealously. Its what convinces me that reading "Dahl's History of the Book" is more important than frittering away the afternoon....blogging... But I'm only 26 with lots of traveling and learning ahead of me.